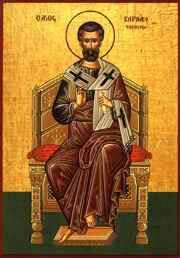 Today is the feast day of St Barnabas, an early Christian who was one of the most prominent Christian disciples in Jerusalem in the 1st century, although he is not all that well known these days, probably because his work was overshadowed by Paul’s. Barnabas, who was a Hellenized Cypriot Jew, undertook missionary journeys with Paul and participated with him in the Council of Jerusalem (c. 50). 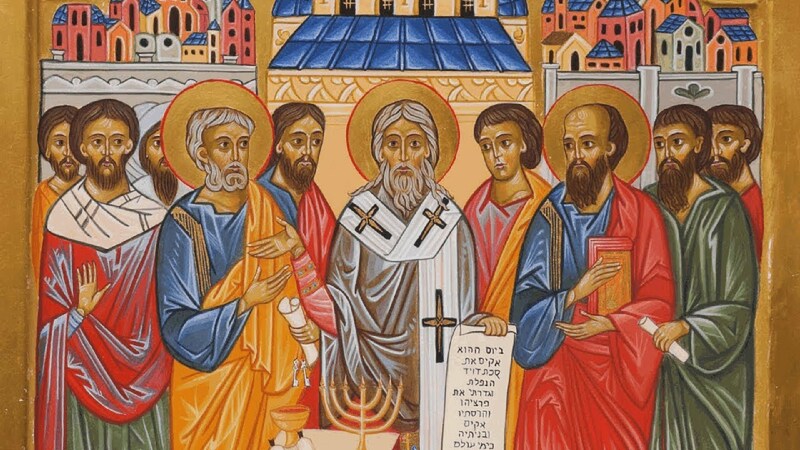 Barnabas and Paul successfully evangelized Gentiles who attended synagogues in various Hellenized cities of Anatolia. Barnabas’ story appears in the Acts of the Apostles, and Paul mentions him in some of his epistles. Tertullian named him as the author of the Epistle to the Hebrews, but this and other attributions are flimsy conjecture. Clement of Alexandria and some scholars have ascribed the Epistle of Barnabas to him, but this authorship is also disputed. General consensus is that if Barnabas wrote anything, it does not survive. 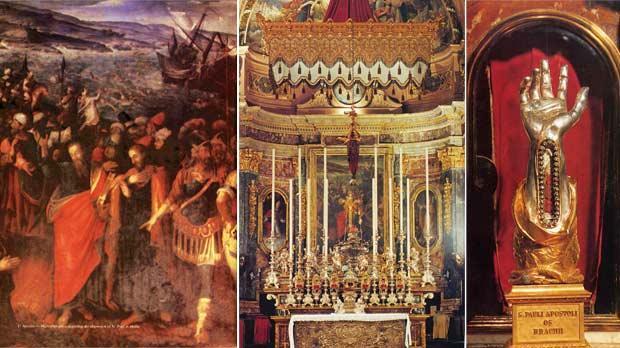 Although the date, place, and circumstances of his death are historically unverifiable, Christian tradition holds that Barnabas was martyred at Salamis on Cyprus in 61. He is traditionally identified as the founder of the Cypriot Orthodox Church. Whatever his status as an early Christian, his activities are well attested historically. We are not now talking about shadowy apostles mentioned in the gospels written well after the events they narrate by people who were not eye witnesses, but a real, live, flesh-and-blood man, written about contemporaneously by Paul in his letters, who knew him and traveled with him. The historicity of the Acts of the Apostles can be called into question; Paul’s epistles cannot. Barnabas was known as Ιὠσης (Iōsēs), a Greek variant of ‘Joseph’, but when he sold all his goods and gave the money to the apostles in Jerusalem, they gave him a new name: Barnabas. This name appears to be from the Aramaic בר נחמה, bar neḥmā, meaning ‘son of consolation’ ultimately, although the Greek text of the Acts 4:36 explains the name in Greek as υἱὸς παρακλήσεως, hyios paraklēseōs, meaning “son of consolation” or “son of encouragement”. Barnabas was a native of Cyprus and a Levite, and is first mentioned in the Acts of the Apostles as a member of the early Christian community in Jerusalem, who sold some land that he owned and gave the proceeds to the community (Acts 4:36-37). When the future apostle Paul returned to Jerusalem after his conversion, Barnabas introduced him to the apostles (Acts 9:27). This suggests that they were previously acquainted. 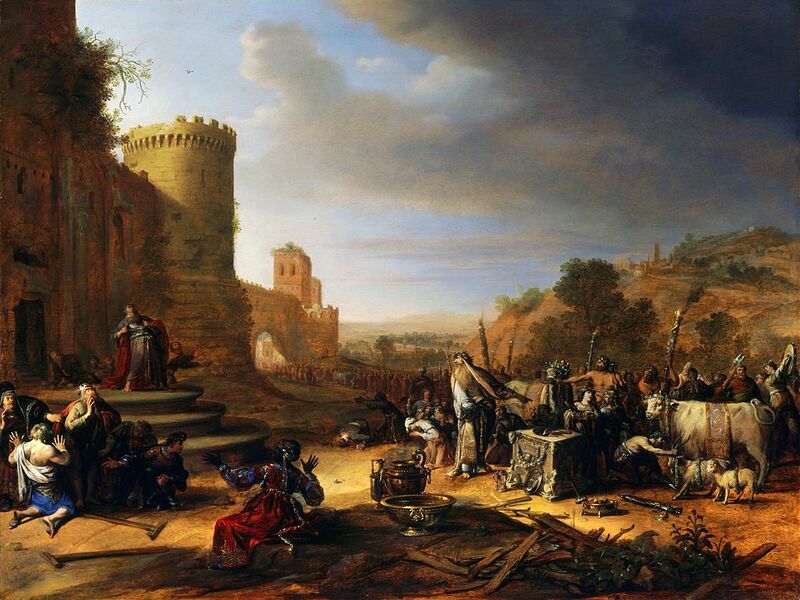 The successful preaching of Christianity at Antioch to non-Jews led the church at Jerusalem to send Barnabas there to oversee the movement (Acts 11:20–22). He found the work so extensive and weighty that he went to Tarsus in search of Paul (still referred to as Saul), “an admirable colleague”, to assist him. Paul returned with him to Antioch and worked with him for a whole year (Acts 11:25–26). At the end of this period, the two were sent up to Jerusalem (in 44 CE) with contributions from the church at Antioch for the relief of the poorer Christians in Judea. 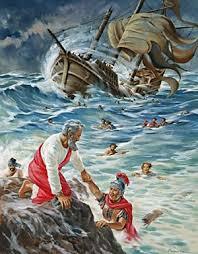 They returned to Antioch taking John Mark with them, a relative (possibly the cousin or nephew) of Barnabas. Later, they went to Cyprus and some of the principal cities of Pamphylia, Pisidia, and Lycaonia (Acts 13:14). After recounting what the governor of Cyprus Sergius Paulus believed, Acts 13:9 speaks of Barnabas’ companion no longer as Saul, but as Paul, his Roman name, and generally refers to the two no longer as “Barnabas and Saul” as previously (11:30; 12:25; 13:2, 7), but as “Paul and Barnabas” (13:43, 46, 50; 14:20; 15:2, 22, 35). Only in 14:14 and 15:12-25 does Barnabas again occupy the first place, in the first passage with recollection of 14:12, in the last 2, because Barnabas stood in closer relation to the Jerusalem church than Paul. Paul appears as the more eloquent missionary (13:16; 14:8-9; 19-20), hence the Lystrans regarded him as Hermes and Barnabas as Zeus. Returning from this first missionary journey to Antioch, they were again sent up to Jerusalem to consult with the church there regarding the relation of Gentiles to the church (Acts 15:2; Galatians 2:1). According to Galatians 2:9-10, Barnabas was included with Paul in the agreement made between them, on the one hand, and James, Peter, and John, on the other, that Paul and Barnabas should in the future preach to the pagans in Asia Minor and Europe, while James, Peter, and John would continue their work in Jerusalem. This was probably the most critical decision in the 1st century for the survival of the Christian church because the sack of Jerusalem destroyed the Jerusalem church, but the churches outside of Israel created by Paul and Barnabas, not only survived, but flourished. Without them, Christianity would have died in 70. This matter having been settled, they returned again to Antioch, bringing the agreement of the council that Gentiles were to be admitted into the church without having to adopt all Jewish practices, most notably circumcision. After they had returned to Antioch from the Jerusalem council, they spent some time there (Acts 15:35). Peter came and associated freely there with the Gentiles, eating with them, until criticized for this by some disciples of James, as against Mosaic law. Upon their remonstrances, Peter yielded apparently through fear of displeasing them, and refused to eat any longer with the Gentiles. Barnabas followed his example. Paul considered that they “walked not uprightly according to the truth of the gospel” and upbraided them before the whole church (Galatians 2:11-15). Paul then asked Barnabas to accompany him on another journey (Acts 15:36). Barnabas wished to take John Mark along, but Paul did not (Acts 15:37-38). Paul and Barnabas ended up taking separate routes. Paul took Silas as his companion, and journeyed through Syria and Cilicia; while Barnabas took John Mark to visit Cyprus (Acts 15:36-41). Barnabas is not mentioned again in the Acts of the Apostles. However, Galatians 2:11-13 says, “And when Kephas (Peter) came to Antioch, I opposed him to his face because he clearly was wrong. For, until some people came from James, he used to eat with the Gentiles; but when they came, he began to draw back and separated himself, because he was afraid of the circumcised. 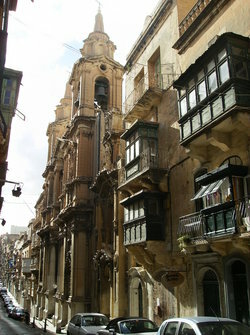 And the rest of the Jews also acted hypocritically along with him, with the result that even Barnabas was carried away by their hypocrisy.” In these early days of the Christian church the split between Paul, who wanted to convert everyone and anyone, and the Jerusalem church, represented by Peter, James and John, saw Christianity as an offshoot of Judaism for Jews only. Peter could waver on his travels, but ultimately sided with the apostles in Jerusalem, and it seems that Barnabas was deeply torn as well. Barnabas is also mentioned in the First Epistle to the Corinthians, in which Paul talks about how they funded their missions, and implies that they had foregone having wives (out of choice). In this chapter he makes it clear that he and Barnabas have every right to expect to be paid by the churches they had founded, but they do not ask them for anything – not even food and drink. They preach for free, and are proud to do so. It is recorded that Paul was a tent maker, but there is no indication of Barnabas’ occupation. It is not just the “prosperity gospel” preachers who ought to pay more attention to this original state of affairs. All preachers and churches ought to pay attention. Do you preach because it is a good thing to do, or do you preach to make money?????? Antioch, the third-most important city of the Roman Empire, then the capital city of Syria province, today Antakya in Turkey, was where Christians were first called Christians. Before that they were referred to as followers of The Way. Some of those who had been scattered by the persecution that arose because of Stephen’s martyrdom went to Antioch, which became the site of an early Christian community. 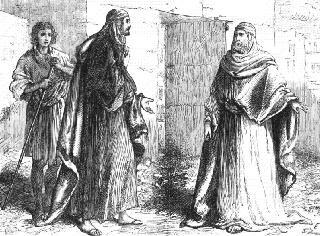 A considerable minority of the Antioch church of Barnabas’ time belonged to the merchant class, and they provided support to the poorer Jerusalem church. Church tradition, developed outside of the canon of the Greek Bible, describes the martyrdom of many saints, including the legend of the martyrdom of Barnabas. It relates that certain Jews coming to Syria and Salamis, where Barnabas was then preaching the gospel became highly exasperated at his extraordinary success and fell upon him as he was disputing in the synagogue, dragged him out, tortured him, and stoned him to death. His kinsman, John Mark, who was a spectator, privately interred his body. According to the History of the Cyprus Church, in 478 Barnabas appeared in a dream to the Archbishop of Constantia (Salamis, Cyprus), Anthemios, and revealed to him the place of his sepulchre beneath a carob-tree. The following day Anthemios found the tomb and inside it the remains of Barnabas with a manuscript of Matthew’s Gospel on his breast. Anthemios presented the Gospel to Emperor Zeno at Constantinople and received from him the privileges of the Greek Orthodox Church of Cyprus, that is, the purple cloak which the Greek Archbishop of Cyprus wears at festivals of the church, the imperial sceptre and the red ink with which he affixes his signature. 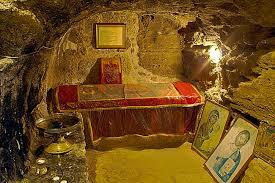 Anthemios then placed the venerable remains of Barnabas in a church which he founded near the tomb. 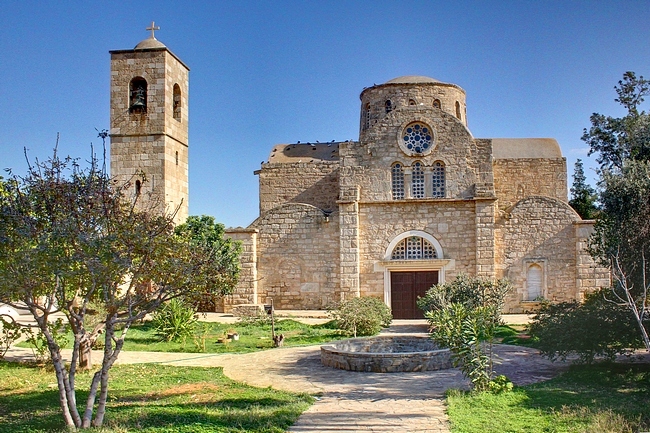 Excavations near the site of a present-day church and monastery, have revealed an early church with two empty tombs, which some claim to be that of St. Barnabas and Anthemios. 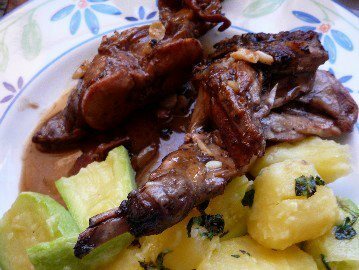 Afelia, pork braised in red wine and coriander, is a Cypriot dish that is pretty much timeless, so can work for the celebration of Barnabas. It is traditional to use belly pork or pork neck, but any boneless pork will work. Mix the wine, coriander and bay leaves and use them as a marinade for the pork. Some cooks put everything in a bowl to marinate for an hour, others let the meat marinate overnight. Go to the HINTS tab for suggestions on marinating. Heat some olive oil in a large skillet over medium-high heat. Drain the meat and reserve the marinade. Quickly brown the meat on all sides. Pour the reserved marinade over the pork, and add the cinnamon (or cumin), along with salt and pepper to taste. Bring to a slow simmer, cover, and cook for about 45 minutes, or until the pork is tender. For the last 10 minutes of cooking, uncover to allow the sauce to reduce if it has not already done so. 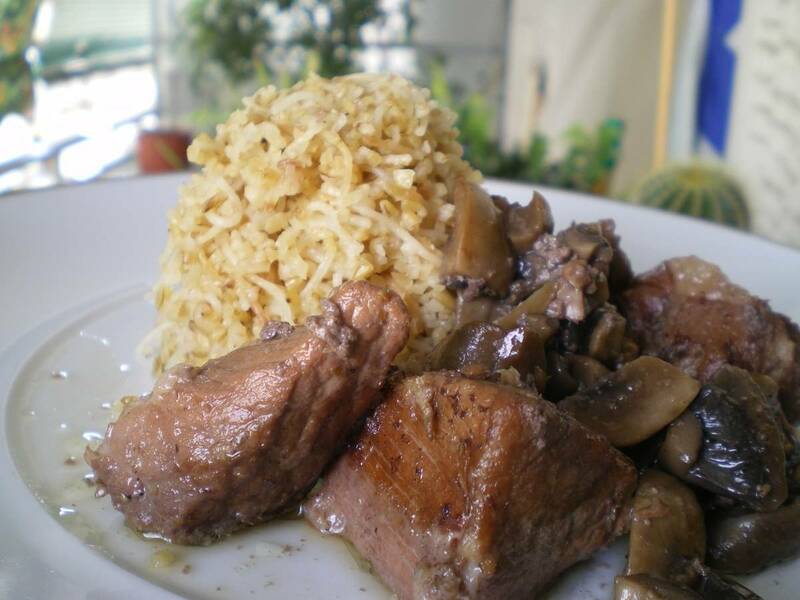 Serve with a rice or bulgar wheat pilaf. 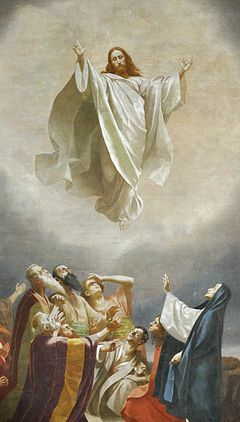 Today is the Feast of the Ascension also known as Ascension Thursday, Holy Thursday, or Ascension Day, and commemorates the Christian belief of the bodily Ascension of Jesus into heaven. It is one of the ecumenical feasts (i.e., universally celebrated) of Christian churches, ranking with the feasts of the Passion, of Easter, and Pentecost. 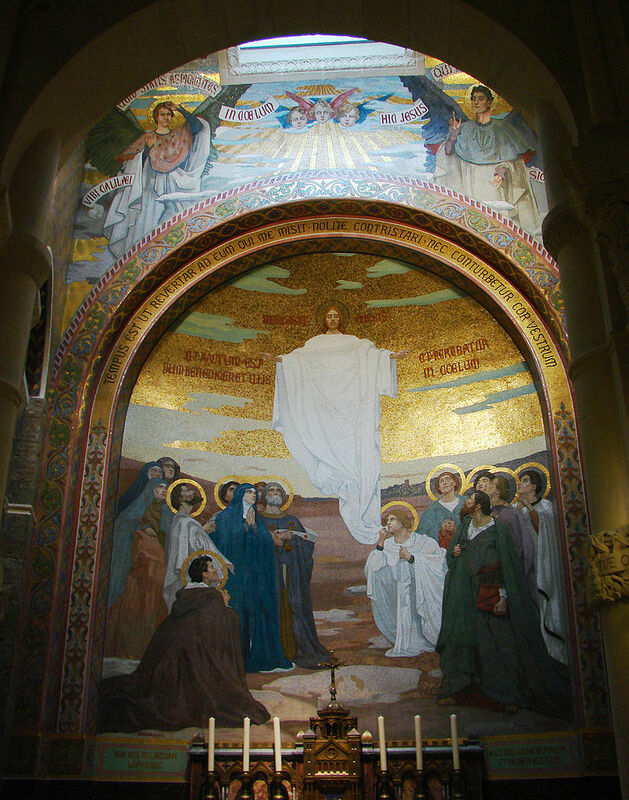 Ascension Day is traditionally celebrated on a Thursday, the 40th day of Easter (following the count given in Acts 1:3), although some Christian denominations have moved the observance to the following Sunday. Many less liturgically minded denominations don’t observe the day in any special way although it is often marked on the calendar. Easter and Pentecost tend to be of much greater importance all around. The ascension of Jesus is an important linking event between the Gospel of Luke and the Acts of the Apostles which were both written by the same author. The Gospel concerns Jesus’ earthly life, and Acts concerns what happened afterwards. This 2-volume work is, therefore, unique in documenting both the events in Jesus’ life and how the early church developed out of those events. Luke uses Mark for the backbone of his gospel but adds a lot of material that is found nowhere else such as the Visitation of Mary, the Nativity, and childhood narratives about Jesus. If you have followed my other posts on Christian feasts you will know that I am highly skeptical of Luke. Practically every story he tells that is found nowhere else “miraculously” solves a logical puzzle. So, for example, how is it that the Messiah is foretold as coming from the lineage of David, and born in Bethlehem, but Jesus – who might be the Messiah – comes from Galilee? Simple. His parents took an unexpected trip to Bethlehem when Mary was pregnant because of a massive census ordered throughout the Roman empire by the emperor. That solves the logical puzzle concerning the Hebrew prophets but fails to account for the fact that no such census is known of, nor could have occurred without the empire disintegrating. 1In my first book [Luke’s gospel] I told you, Theophilus, about everything Jesus began to do and teach 2 until the day he was taken up to heaven after giving his chosen apostles further instructions through the Holy Spirit. 3 During the forty days after he suffered and died, he appeared to the apostles from time to time, and he proved to them in many ways that he was actually alive. And he talked to them about the Kingdom of God. So now we have a convenient segue into the descent of the Holy Spirit upon the disciples and the birth of the church. A little too convenient if you ask me. Stories of Heavenly ascents were fairly common in Judaic sacred texts signifying divine approval or the deification of an exceptional person. 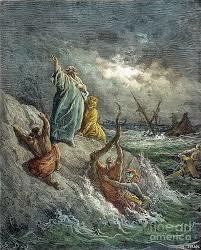 Elijah, for example, does not die but ascends to heaven in a whirlwind (2 Kings 2:11). The Roman Catholic church continued this dogma with apocryphal tales of the ascension of Mary, mother of Jesus, who logically could not have died because she was born without sin, and therefore was not subject to the penalty for sin – death. The ascension also assumes an ancient cosmology in which the sky is a big dome covering the earth, and heaven lies beyond that dome. By this reckoning, heaven is a space above the sky, so that people who are exempt from death can simply float up to the sky and beyond. 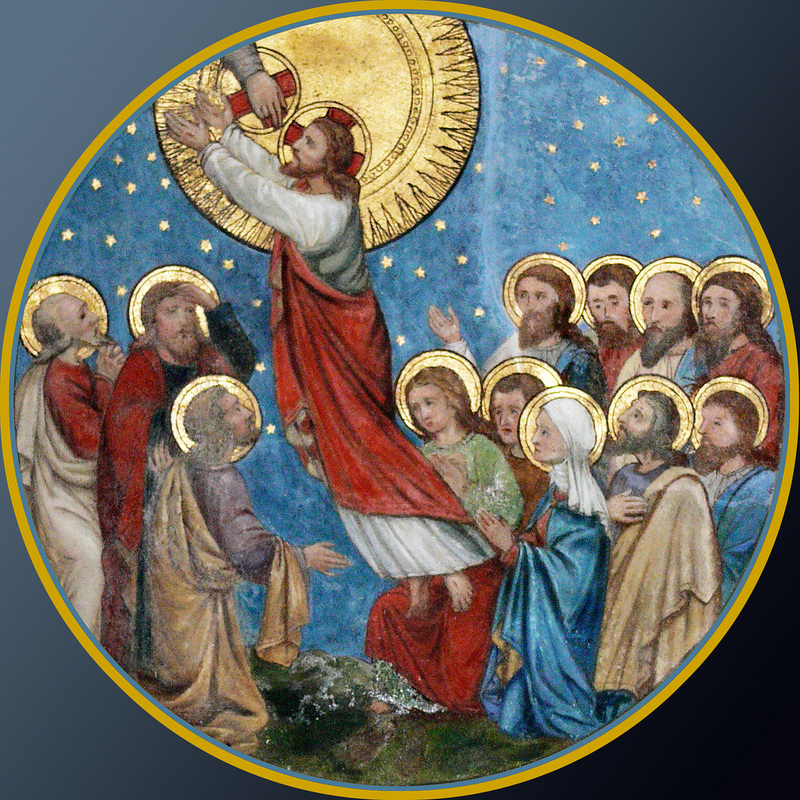 Although it took several hundred years to develop a grander and more sophisticated cosmology, the story of the ascension of Jesus still has its devotees. I’ve chosen angel cake (angel food cake in the US) for my recipe today. Usually I buy it when I want one (generally to eat with strawberries), but homemade is better – but a bit tricky to get really light. Maybe I’m being a bit cynical concerning Luke’s story by giving you a recipe that rises a lot, and floats like clouds, like Jesus did, but I assure you I am only cynical about Luke’s rationalizing, not about the heart of the Christian message. Sift half of the sugar with the salt and the cake flour. In a large bowl, thoroughly combine the egg whites, water, orange extract, and cream of tartar with a whisk, or a stand mixer with a balloon whisk. When the egg whites start to foam switch to a hand mixer. Slowly sift in the remaining half of the sugar, beating continuously at medium speed. Stop when you have medium peaks. Sift enough of the flour and sugar mixture to dust the top of the foam. Fold the flour in gently with a spatula, then repeat until all of the flour mixture is incorporated. You must maintain the foam as much as you can. Spoon the mixture gently into an ungreased baking pan (I use non-stick tube pan). Bake for 35 minutes then check for doneness by inserting a tooth pick. When done it will come out clean. Invert the pan on a cooling rack, and cool for at least an hour before attempting to turn out. 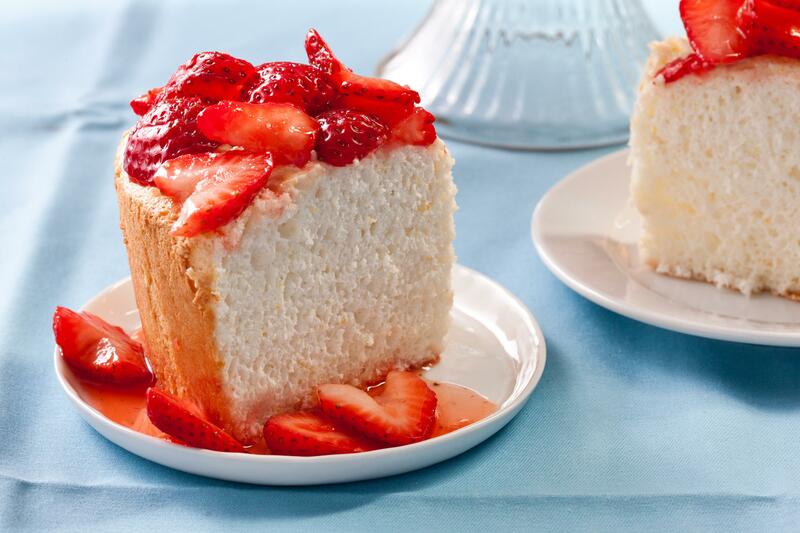 Typically I serve angel cake with strawberries I prepare by slicing them into a bowl, dusting then with superfine sugar, and leaving them overnight it the refrigerator. Next day the juices from the strawberries make a tasty sauce.